Bleu Crimini Quiche — always with butter. My new obsession with bleu cheese begins. Well I have liked it for quite a while now but had yet to cook with it. Growing up I hated it, for that fact it had all those moldy veins which freaked me out beyond belief. And that it was such a strong flavor but now I love the flavor and kept eating huge chunks of it straight while baking this. The online magazine NEET emailed me during the summer asking if I wanted to be featured in the September issue along with a few other bloggers for their special 'comfort food' section. After clicking on their website I of course said yes, falling in love with all the photography they had put in their magazine before. If only it was in print too! The issue just came out, so go check it out! HERE is the link, y'all. Honey & Jam and Desserts for Breakfast are the two other amazing bloggers featured. Having been obsessed with both of those blogs for months now, it is really an honor to be shown next to them. Hannah's tomato soup is such a beautiful photo, the minute I saw it on her flickr I literally said out lough, 'oh my god.' The styling, lighting, that essential Hannah touch that makes me immediately know she took the photo; everything works. Her photos have such an amazing golden glow. And it is a vegetarian recipe, so even better! At the tasting salon featuring Claire Ptak and Andrea Blum, which was super amazing and will tell you all about later, the first course was a tomato bread gazpacho. I think it was my first time every having a cold soup, and it was so great tasting. The tomato were just picked from the garden and so were the herbs that went into it I believe. Stephanie of Desserts for Breakfast made and photographed the caramel apple crumble. Like seriously? you made a crumble even better by adding caramel to it. Genius! After reading the article about her in the magazine, I realized she lived so close to me, very close. What a small world! Her photos are always really amazing too, did you see her fig, mascarpone and pistachio tart post? A thing of beauty. Once I get some more figs, I want to make that right away. For the crust, pulse flour, salt & pepper in a food processor. Pulse in butter until it resembles coarse crumbs. Drizzle in the water until it forms a ball in the machine. Form into a disk, wrap in plastic wrap & chill for 1 hour. Oven 375, grab your 9 or 10-inch pie pan. Roll out dough to slightly larger than your pan. Put dough in pan and trim off any excess crust. Prick the bottom with a fork and freeze for 30 minutes. Line dough with parchment paper and fill with pie weights. Bake for 20 minutes, until edges are golden. Remove parchment and weights then bake for 15 more minutes, until golden brown. Let cool. Reduce oven to 350. 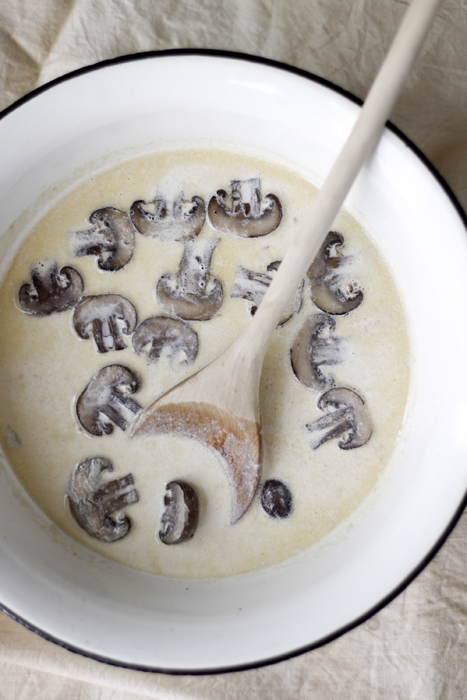 In a skillet, melt butter then add mushrooms and cook for an additional 2 minutes. Stir in milk and cream, then bring to a simmer. Transfer to a bowl, let cool for 30 minutes. Stir in salt and pepper. Whisk eggs in a medium bowl then stir into mushroom mixture. Fold in cheese and scallions then pour into crust. Bake for 20-30 minutes until filling is puffed and golden. Serve warm or at room temperature.